By the end of fiscal 2017, Sears Holdings will have closed more than a quarter of its stores in the span of a year. However, it may be too little, too late. Store closures have been a dominant theme at struggling retail giant Sears Holdings (NASDAQOTH:SHLDQ) lately. The Sears and Kmart chains are both losing money, and the company hopes to shore up its financial position through downsizing. Last week, Sears Holdings announced that it will close another 63 stores in January. However, there's no sign that closing more stores will allow Sears Holdings to avoid -- or even delay -- its ongoing spiral into bankruptcy. Declining vendor support is playing a major role in Sears Holdings' demise. Typically, vendors allow major retailers to pay over time for their merchandise purchases. However, Sears' suppliers are demanding ever-stricter payment terms, due to their worries about the company's financial health. Sears' management has disputed the extent of this problem, but the numbers don't lie. As of late July, Sears Holdings had $670 million of merchandise accounts payable, representing less than 20% of its inventory. That was down from 29% a year earlier. In effect, Sears is self-financing more than 80% of its inventory today, putting further pressure on its cash production. Closing unsuccessful stores has two potential purposes for Sears Holdings. First, the company hopes to reduce its annual losses. Second, it can also reduce its inventory, thus providing a short-term boost to cash flow. 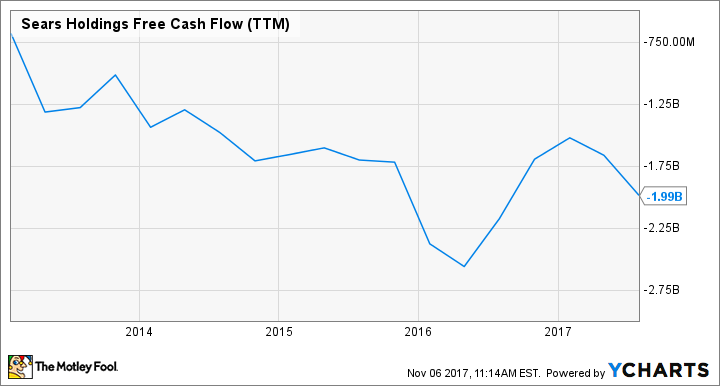 Kohl's (NYSE:KSS) has successfully used inventory reduction as a tool to supercharge free cash flow since 2016. Sears Holdings is closing stores at a rapid rate. Image source: Sears Holdings. During fiscal 2017, Sears Holdings has gone "all-in" on store closures. During the first half of the year, it closed 125 Kmart stores and 51 full-line Sears locations. It closed more than 100 additional stores last quarter (mostly Kmart locations), and another 28 Kmart stores are scheduled to close this month. Including last week's announcement -- which impacts 18 Sears stores and 45 Kmart stores -- Sears Holdings will have shuttered more than 25% of its stores during 2017. Unfortunately, while closing stores will help Sears cut costs, it doesn't address the company's real problem, which is that customers are abandoning it. In total, Sears Holdings hopes to reduce its operating expenses by $1.25 billion this year, but revenue is on pace to plunge by $5 billion. The net result will be little or no improvement in profitability. The worst news for Sears Holdings shareholders is that closing stores may not improve liquidity as much as management hopes. Every time the company closes a store, it must mark down inventory even further as part of the clearance sale. It's also on the hook for severance costs for many employees. Sears executives have previously stated that these costs are more than offset by the cash windfall from liquidating inventory (thus reducing working capital) and -- in some cases -- selling the store building. This would certainly be true if Sears were a profitable company like Kohl's. For Kohl's, the extra cash generated from reducing inventory or selling assets is available to be returned to shareholders. By contrast, the impact on Sears is less clear. The issue is that Sears Holdings routinely borrows against its inventory and real estate to fund inventory purchases and other expenses. As the company downsizes, it will have less inventory and real estate available to use as collateral for future loans. Thus, the net improvement in cash from closing stores may be fully offset by lower borrowing capacity. Liquidity is quickly becoming a major problem for Sears Holdings. It is burning cash as fast as it can sell off assets, and there is a large amount of debt coming due in mid-2018. Until now, Sears' billionaire CEO Eddie Lampert has always stepped in to keep the company afloat. But if the company runs out of collateral for new loans, that lifeline could disappear, leading to the demise of one of America's most iconic retailers.